My colleagues and I are working on a mobile app (Android and iPhone) that allows users to browse a social feed. Each post in the feed consists of a mandatory picture, optional text and comments on the post (kind of similar to Instagram). The picture will be as large as possible (not a thumbnail) because the main focus of the app is visual vs. textual. Ergonomics: I find it easier to swipe horizontally. Although this is a debatable opinion. Flexibility: Users can quickly "page" through posts by swiping to the next one. If a user wants to see more content within a given post (mostly textual comments) he/she can vertically scroll for that additional content. Familiarity: almost all social feeds seem to be presented with vertical scrolling. Simplicity: by scrolling in a single direction, one can scroll through posts and associated comments in a seamless manner. Should the fact that all social feeds currently implement vertical scrolling only prevent us from exploring the mixed navigation option? Based on the above description, which navigation paradigm is best? It seems you're coming up against the Principle of Least Astonishment, i.e. "If a necessary feature has a high astonishment factor, it may be necessary to redesign the feature." The industry has decided upon a style, and we're stuck inside that paradigm until something massive shifts it. Could it be your app? Yeah! Is it likely to be? Probably not. Of course, if you really think it's the best way to display more information (maybe you have a lot of supplementary info), then you could always design an excellent onboarding procedure. If you do decide to go this way, remember that people are used to sliding list items one way or another, so maybe that could help inspire your design? Vertical only makes sense if the contents that are being displayed on the "timeline" or "newsfeed" are summarries of the stories. In other words, users need to tap on the stories to read the details (similar to Facebook). Otherwise, if you display the full stories on the timeline, often times users want to scroll to the end of the post but end up going to the next post (which has UX issues). Not the answer you're looking for? Browse other questions tagged mobile navigation scrolling or ask your own question. Is swipe gesture in Mobile Application distracting users with vertical scroling page ? 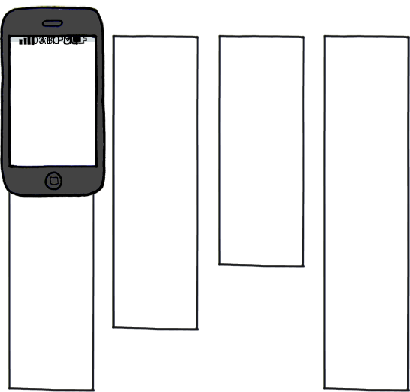 Horizontal or vertical navigation on mobile saas apps?